During this time of year we like to use the word "tradition" a lot - passing down activities that older generations took part in or creating new ones with our own families. Using specific things like grandmas fine china or hanging an heirloom ornament on the tree (if you have one) gives us the warm and fuzzies. I was asked to share my opinion on holiday traditions for baby's first Christmas recently and during the conversation I found myself talking about the importance of creating something that is comfortable for your individual family - however that looks. Gone are the days when everyone lived in the same state let alone neighborhood, so getting together is harder and it can make the holidays a little tricky. My family always had the same tradition during the holidays, Christmas Eve was at my parent's house with family and friends and Christmas Day was at our friend's house. We did that for many years and then the kids started getting married and having kids of their own and the holiday's started to look different. After I moved back to New York, we made the decision to continue to go to Florida for the holidays. Once we had a family of our own we decided to continue that tradition with our children with a twist. Now we split it! We still go to Florida to see our friends and family, and we also have our own family Christmas at home. This way we get to create new family traditions and continue with the old ones, (and we don't have to drag gifts with us). I got to thinking about how holidays look now that we're parents ourselves. My parents, mom especially, wanted the holidays to be full of love, food and gift giving. We used to decorate the tree as a family when we were kids and my mom made it a point to make sure my brother and I had the same amount of boxes under the tree as to not disappoint anyone and she still does it with her grandchildren! (crazy much?) I like to do a lot of similar things that I was brought up with. We decorate our tree and home, bake cookies to give to friends and donate to charities. I feel like now a days the holidays are much faster moving. Maybe it's because there's a finite amount of time to spend with our loved ones because we don't live near one another that we're trying to cram it all in? I dunno, it just feels like it happens way too quickly. Don't blink, you might miss it! As time passes, some traditions may fall by the wayside. I was chatting with a friend the other day who is not particularly fond of putting up a Christmas tree. It's not a big deal to her and she figures her daughter is still small enough that she won't know any better. 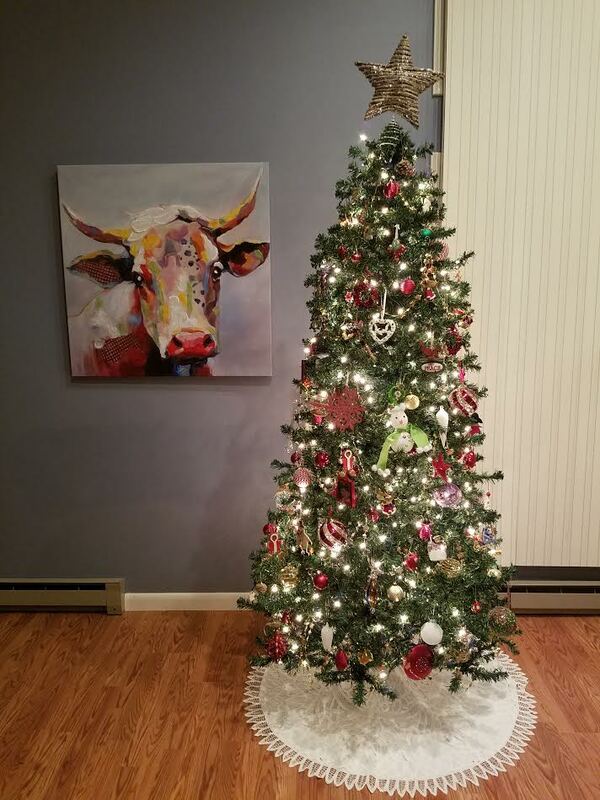 She does however, have an artificial tree that was given to her by a neighbor that her nanny found last week and took it upon herself to put up and decorate while my friend was at work. She said when she came home she was taken off guard and pleasantly surprised by the gesture. It's not that she doesn't like having a tree she realized, she doesn't like assembling it! So we talked about creating a tradition by where her daughter gets to put up the tree with her nanny and that can be their special time. I likened it to creating a recipe - put in all of the ingredients that make you feel good and remove the ones that don't. Every family recipe will look different - unique to them, and it can evolve. Some recipes over time increase the ingredients, some switch out for new ones. There's no wrong way to do it. My family recipe is still in the works. We're constantly tweaking it. Some years we try a new thing, and other years we stick to the familiar plan. That's the great thing about recipes, you can change them. I can't help but wonder how our recipe will evolve as our children grow. Sometimes the thought of losing the familiarity of a tradition is a little sad, other times a change can be exciting. I'm choosing to embrace all of our traditions and creating new ones with my family. What does your family recipe look like?